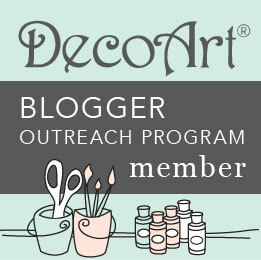 Hello, Crafty Friends!! Happy Thursday! 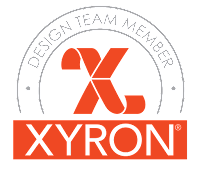 I'm super excited to be back with Team Xyron today. We have partnered up with Paper House all week to bring you fantastic projects all week! 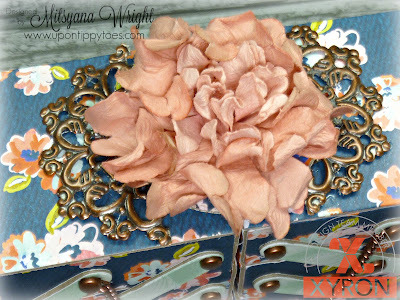 And today, I made this Victorian Inspired Cantilever Jewelry Box. I absolutely love brooches and pins. My mother is a fanatic. She wears a brooch on almost every outfit she has on. She was the one who started me on my brooch loving journey. She has given me some over the years and a few I still have till this day. Some were old and passed on to me, and some were brand spakin' sparkly, shiny, and new. Even though I love the bling and the shine of the new, I love the older ones more. They have a history. They tell a story of the people who have handed it down. And now their story become my story. Because my family and their history is a big part of who I am. And even though I love these little shiny badges of pride. They all have one thing in common, a need for space. I hate when the get jumbled up on one another. I don't have a ton of brooches so a massive jewelry box didn't seem appropriate. 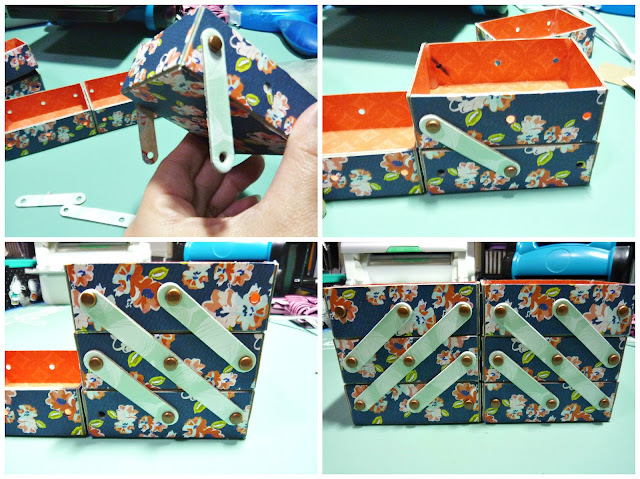 So instead, I made this little jewelry box to store and house them neatly. I started by cutting 6 pieces of chipboard to 5"x 6". I also cut 3 pieces each of the Grandparents Tags (Blue Floral) and One Big Happy Family (Burnt Orange Print) down to 5"x 6" pieces. 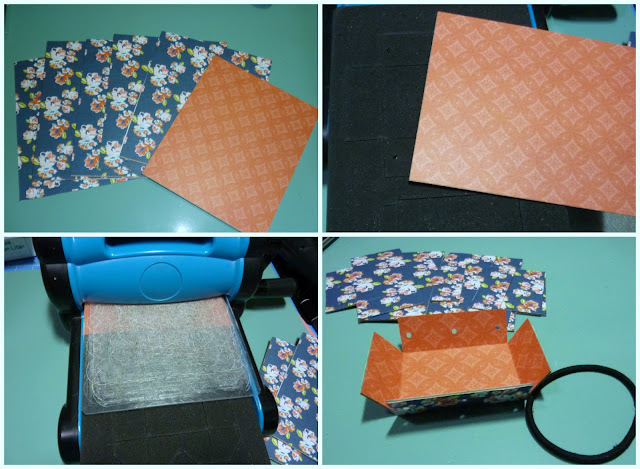 Then, ran the patterned paper through my Creative Station Lite. Once through I gave them a good burnishing with a bone folder to ensure maximum adhesion. I peeled back the protective film and attached a sheet of each patterned paper to each chipboard piece. Now that the chipboard is double sided, I die cut 6 drawer boxes using a Cantilever Box Die (making sure to place the chipboard piece only over the drawer box section of the die and placing blue floral side down). Then, I folded up the drawer walls along the crease lines. 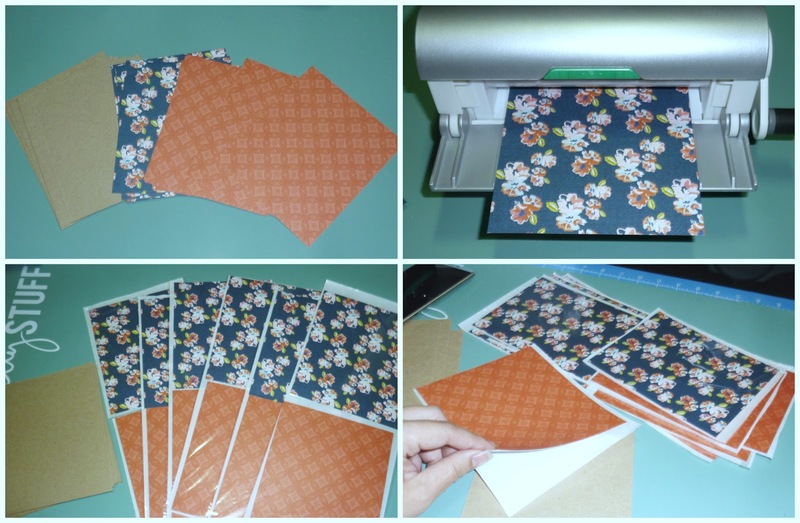 While the sided are folded up, secure walls by wrapping a rubber band around them. Then add hot glue to all 4 corners. Repeat for all 6 drawer boxes. Next, Hot glue two boxes together along its shorter walls. This is will be your bottom base drawers. 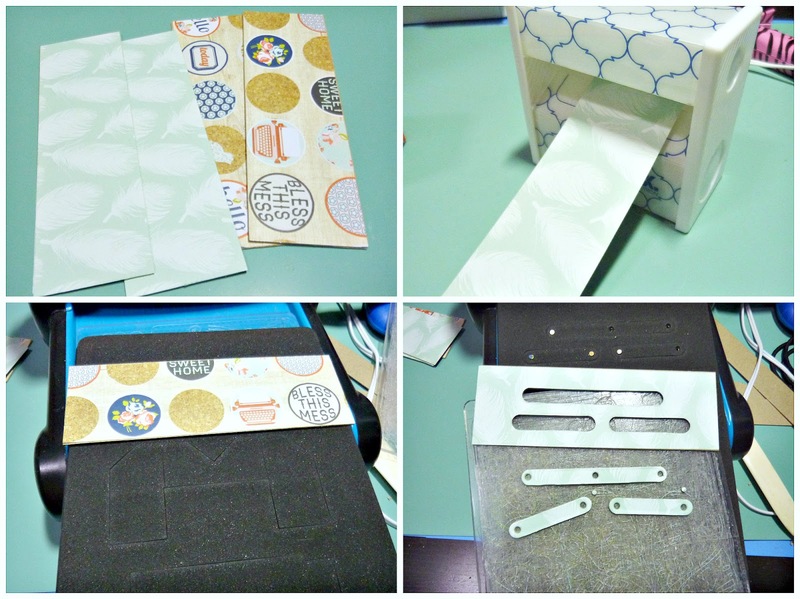 I repeated the same step above for the lever pieces using the Love Lives Here paper. These pieces measured 2-3/4" x 6"(before die cutting). I fastened the levers with brads, arranging them diagonally and then attaching with brads. I die cut the 2 feet and the 2 lids and hot glued them in place. I cut a metal embellishment in half (one for each side) and adhere to tops. Then I topped with a flower (only glue down to one of the drawers). At the last minute, I added these copper chains by just taking out the brads and inserting the prongs in between the links before inserting back into the holes. 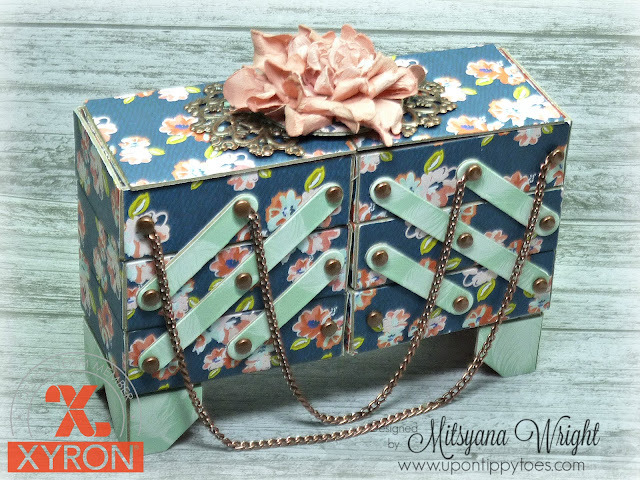 And here is my finished jewelry box for my pins!! I hope you enjoyed today's project! If you would like to see more creative inspiration please stop by Facebook and visit the Xyron and Paper House pages. And as a special treat, Xyron is giving away a prize package! YAY!! All you have to do is visit their page and comment on any of the Xyron/Paper House projects posted during the week! Easy Peasy! This was a sponsored post. I did receive product to endorse prior to making this fabulous project. However, the designs, ideas, and opinions on this blog are 100% my own and do not necessarily reflect the opinions of the companies above. This is stunning! 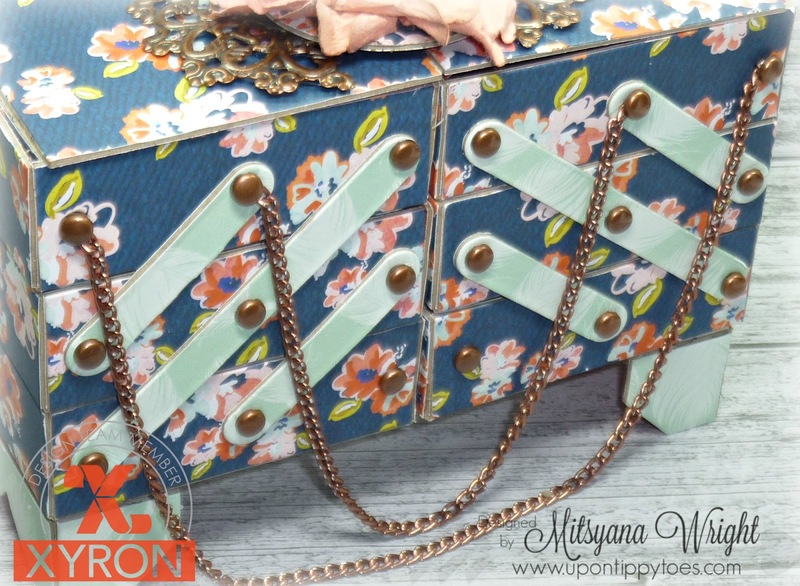 Great combo of products Mitsyana. Love especially the flower closure! What a fantastic project. Love the colors. Great instructions for this pretty box. TY for sharing.